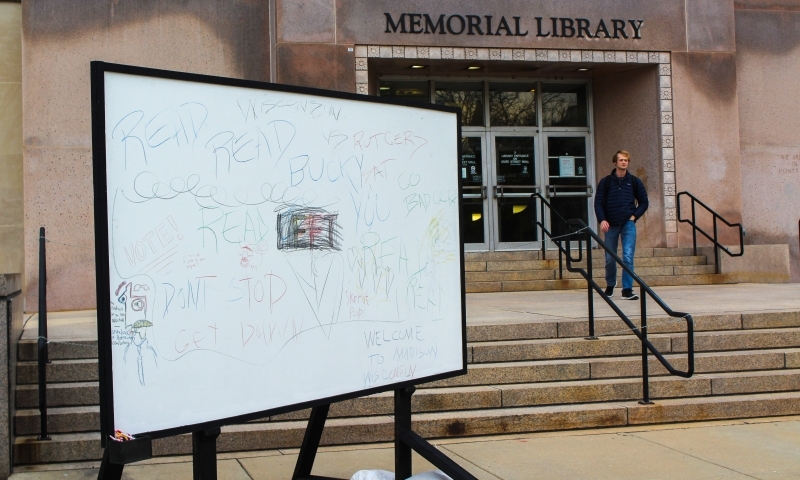 An art piece installed in front of Memorial Library invites passersby on Library Mall to interact with it. The piece, created by UW-Madison [Master of Fine Arts] graduate student Matthew Vivirito, was constructed Thursday morning. The project, titled and the people, is an iteration of a past installation the artist organized at the University of Colorado-Boulder. The piece was set up two different times at that campus, and the artist decided to bring it to UW-Madison. The sculpture consists of three large boards of canvas, situated on the pavement to the left, right and center. The board on the right is labeled “RIGHT” and the board on the left is labeled “LEFT” while the one in the middle says “and the people.” There are two baskets of colored pencils which are intended to be used to write on the boards. “Basically it’s just creating a public forum for students and the wider public to interact. I try to do one of these with every election to get some dialogue out in the air,” Vivirito said. Any art installation that goes up on campus must go through an application process through the Facilities Planning and Management Department. Vivirito and artists like him must obtain a department sponsor in order to apply.